Toth was having a little fun with his guest, but he was also describing what many believe will be the most desirable employee of the future, one who has a college degree and a certificate or diploma from a technical college. Such a creature would be almost impervious to the slings and arrows of just about any kind of economic downturn. A cultural anthropologist or behavioral scientist studying the survival instincts among the legions of Georgia’s unemployed workers over the past four years could only draw one conclusion: They found the most promising hope for a job by stopping first at one the state’s technical colleges, to either upgrade their existing skills or cross-train into another job or profession where opportunities for employment were more plentiful. This education demographic is just one of the factors responsible for a 28 percent enrollment growth at Georgia’s 26 technical colleges during 2010, according to Ron Jackson, commissioner of the Technical College System of Georgia (TCSG). To keep those high school grads lining up at the admissions office, the state’s technical colleges are becoming more like their cousins at the University System of Georgia (USG), offering extracurricular activities such as sports and funding them, and other projects, with endowments in their foundations. While taking a date to the Friday night basketball game may be fun, the technical college basketball program also makes better students, Jackson says. “Giving them extracurricular activities, we find that our retention rates and completion rates are higher,” he says. There is an aerial photo of the campus of South Georgia Technical College (SGTC) in Americus that features a short walkway at its center. The little stretch of pavement is unremarkable, but the land below it is a piece of American history and hallowed ground to aviators. From this spot in May of 1923, Charles Lindbergh guided his sputtering Curtiss JN4 Jenny biplane into the air to begin his 30-minute solo flight from what was then Souther Field, a WWI pilot training site. Lindbergh would make a far more noted solo flight four years later when he was the first man to fly the Atlantic Ocean on a 33-hour trip from New York to Paris. Today Souther Field is the Jimmy Carter Regional Airport, named for a homegrown notable, and it is home to South Georgia Tech’s Griffin Bell Aviation Center, named for the late former federal judge and U.S. Attorney General, also a Sumter County native and a significant benefactor of the technical college. There was another notable flight into the Carter Airport last year, one made possible by a 1982 SGTC graduate who became the lead mechanic for the Athens-based Jets R US, an aviation company. “He called and asked if we wanted a Learjet,” SGTC President Sparky Reeves says, clearly relishing his story and not a man who would refuse the gift of a Learjet. “They were retiring two of their jets and offered us one. We were tickled to death to have it and it flew here from Athens in 22 minutes, landed at the Jimmy Carter Regional Airport and taxied over to the Griffin Bell Aviation Center.” The jet promptly became a learning tool in the college’s aviation technology courses. On several levels, South Georgia Tech serves as an example of how the modern technical college operates, particularly in a time when resources are scarce while demands for workforce training are rising. Tuition and paid training partnerships with industry are two important revenue sources. More and more freshly graduated high school students are helping boost enrollments, with the younger students attracted by the fast-track curricula and broadening extracurricular activities. SGTC has men’s and women’s intercollegiate basketball teams, the only technical college in the state to do so; the college’s foundation currently has about $5 million in endowments for use in funding those activities and has funded 306 scholarships over the past three years. The school is one of only two technical colleges to offer on-campus housing, though there are discussions system-wide on building small residence units on some campuses. The college finds the on-campus residence halls vital to the health of the school’s relationships with companies like Cater-pillar, whose dealers send employees from seven Southeastern states to SGTC for study and training programs at the Caterpillar College of Techno-logy, one of 11 in the world. “We were chosen because we were in the Southeast; we made a commitment to remodel one of our old hangars to suit their particular needs; and the key here was on-campus housing to take care of employees or students Caterpillar could send us on a 10-week rotating basis,” recalls Reeves. Georgia’s technical colleges can trace their origins to the 1917 Smith-Hughes Act, co-authored by Georgia’s U.S. Sen. Hoke Smith. The legislation was a congressional mandate to all the states ordering them to create a state board for vocational education, according to the New Georgia Encyclopedia. It would be 1944 before the North Georgia Trade and Vocational School opened in Clarkesville, marking the genesis of the state’s modern technical college. The second such school opened in Americus in 1948 and evolved into what is today South Georgia Technical College. By the end of the 1960s, there were 19 “vo-tech” schools in Georgia, and the schools were assuming more re-sponsibilities, such as teaching some Georgians how to read and write. Today more than 190,000 students are enrolled in the Technical College System of Georgia, studying on the 85 campuses of the system’s soon-to-be 25 institutions and their satellite facilities. With 6,000 full-time employees and 12,000 part-timers, the schools are themselves job makers and economic development allies for their host communities. Even the most senior TCSG officials have difficulty remembering when the system didn’t have annual double-digit growth, lately at a time when state funding was moving downward. Six years ago Columbus residents learned some 30,000 people would be invading the western region of Georgia following the decision from the De-fense Base Closure and Realignment Commission (BRAC) to move the U.S. Army Armor School and Center from Kentucky’s Fort Knox to Georgia’s Fort Benning. The region’s newest citizens will begin arriving in force later this year and will include troops, civilian employees, contractors, vendors and their families. In addition to seeing what educational services CTG might need to add or change in its 80-subject curriculum, the staffers also extended warm welcomes and described living conditions in the Columbus area, housing availability, the quality of schools, recreation opportunities and healthcare services, a subject long on the minds of Columbus Tech executives and one that led to a fortuitous decision long before the population flood around Fort Benning was anticipated. Commissioner Jackson meets every other month with the presidents of his colleges to keep them posted on policy changes; listen to presentations on subjects like improving energy efficiency; and to bounce ideas around the meeting room. The first meeting of the new year had been scheduled for Atlanta; but a winter storm covered the city’s roads with ice, while mists, rains and fog made driving a bit more dicey than normal. So the event was moved to Macon, where questions were raised about how much life is left in the system’s buildings and how their energy efficiency can be increased. Now, he says, almost everyone in the state lives within commuting distance of a technical college, and online study programs are at the fingertips of all Georgians. “But there are special circumstances where some campus housing is warranted,” Jackson says. One of those foreign exchange programs has been sending students to Europe for the past 12 years. 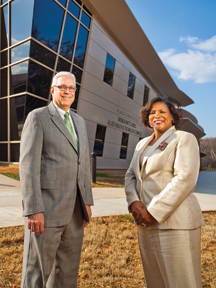 “It began as a cultural exchange bringing together people from different backgrounds,” says Dr. Alvetta Thomas, president of Atlanta Technical College (ATC), the third fastest-growing community college in the nation among schools with enrollment between 2,500 and 4,999, according to a higher education publication. Thomas sees ATC’s growth as a natural byproduct of Metro Atlanta’s population increase, aided by a vigorous marketing program. Keeping up with technology, especially in high-demand courses related to healthcare professions, also contributes to sustaining growth, Thomas says, pointing to the beginning of classes in the newly opened Brenda Watts Jones Allied Health and Technology Complex, a $14.8-million educational facility on the ATC campus.